I have a cream Chow Chow female here in North Pole, Alaska. She is purebred. I met with the owners since the day after the pups were born. The mother and father were on site, as well as the grandparents. The subject of interest is about the cream chow's tongue pigmentation or tongue coloration. Our cream chow (named Suka), has a considerable amount of pink on her tongue. I understand that everyone of the world associate chow chows with the blue black tongue. Now, when people learn that she is a chow, they assume that she is a mix because of the pink in her tongue. Even our veterinarian met us with a thought that chows have an all black tongue. No intentions of bashing veterinarians, they are trained/schooled/educated in recognizing health problems, not breed specific traits or show disqualifications or show standard traits. I have read that cream chows have pigmentation problems, leading to eye rim, mouth, tongue, and/or nose "discoloration". I have a cream chow female that is four months of age, with most of her tongue pink. I am being met with "she is not a full chow, she is mixed" because of the pink on her tongue. But then why do most people assume a dog with black spots on the tongue are part chow? Chows are not the only dog breed to have a blue black or purplish tongue, they share the trait with the Shar-Pei. Also, there are at least 20 full purebred breeds that have the black spotting on their tongues, with no mixture of breeds into their pedigree. My purpose of this posting, is to see if there are and know if there are other cream Chow owners, with pink tongues, mouth, palates, lips, or any other areas of the body. Thank you for your time and feedback, I appreciate every bit of it. It really doesn't matter how many generations of parents you meet, unless you have registration papers that can define her pedigree, she isn't considered a pure bred dog under any circumstances by anyone and yes, could be mixed, even of the mixing was done generations prior. Also, the black tongue is basically a requirement in the showring. If a chow would have a spotted tongue or a non black tongue it's considered a fault, similar to broken over ears, but in many cases, that does not mean that the chow isn't a purebred one. Just enjoy her for who she is. I too has a cream chow.. I got him on his 9th week and 50% of his tongue is not black. As of now, she is 3months and 1 week, her tongue is almost completely black, about 90%. Also, her nose, before she reaches 3months is black, as of now, i am noticing that her nose is becoming flesh, which is normal for a cream chow.. I think you have observe if you chow's tongue is improving from time to time.. Nevertheless, whatever the color of the tongue is. 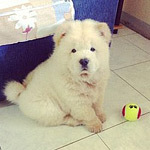 I still love my chow.. Cream chows tend to break from the traditional black mouth, tongue and nose. That does not mean they are not purebred by any means. Creams that have the full black colorings are actually very desireable. They are rare in the show world, because as Merlin pointed out, its a disqualification (for showing, not for being a chow). If you have doubts about the heritage, get the family tree. That should resolve it. Otherwise, i am going to guess that you have a fantastic family pet. She will be what you train her to be behavior wise, and will most likely be very 'chow loyal'. Have owned 2 creams in the past, and they were great dogs. And note, that the coloring may come in late...maybe not the nose, but the mouth may still blacken up. Yes she is my baby pie, and is turning out to be the best family pet. I have a pitbull and a 10 year old daughter that she adores, and they all get along great as a family. She is showing that chow loyalty, even at almost four months of age. We had options to get papers, but we are not interested in papers. I just wanted to know if others are having the same tongue colorations with their cream chows. Her littermates all have a solid black tongue/mouth, and yet they were all black coated. I've read that the blacks have the most pigmentation. Its been an interesting research on these dogs. I grew up with one, and it is a joy to be able to have another in my life. We had options to get papers, but we are not interested in papers. ????? Why wouldn't you want your dog/s papers? The litter or the dog is either registered or it is not registered, and if it is, you are entitied to those registration papers at no additional cost. A breeder CAN withhold breeding rights but if the dog is registered then you are entitled to those papers. In some countries the dilute nose on cream chow is permitted in the showring, in some countries it is not. A spotted tongue never though. I have had several purebred chows, some with papers & some without. My first creme chow didnt have papers because we had the choice to pay more & get papers or pay less without papers. Since there was never a plan to show or breed we took the less expensive option. Of course, that was almost 20 years ago when everyone wanted a chow chow. So I understand you not getting papers. I have had many chows and chow mixes over my lifetime. Since they were never for show or breeding, I never considered the differences 'faults' or 'flaws', in fact it was what endeared them to me. But I digress...my current 2 are so creme that most people think they are white (when they are clean that is, lol). Belle has the complete black tongue & mouth but Chumley has the black tongue but mouth is lighter with pink gums. Both have a flesh/brown colored nose. I also once had a chow shepherd that had a completely black mouth. And I recently rescued/transported a pair of purebreds from a backyard breeder and one had spots of pink in her mouth. As Rory's Dad said, spots of pink on the tongue does not mean your chow isnt purebred. It just means sometime in his genetics was that 'fault'. I have had several purebred chows, some with papers & some without. My first creme chow didnt have papers because we had the choice to pay more & get papers or pay less without papers. Excuse me. that's unethical and a breeder may not charge you more for papers. This person should be brought reported to the ethics committee. I bred a litter of pure bred UK kennel club registered puppies. Three of them are creams. They were born with cream pink noses and mouths and over the next few weeks and months their noses turned black and their tongues turned a lightish blue/purple and the skin round their lips turned dark to match their noses. Their gums are still completely pick round the base of their teeth but further up where gums join to cheeks they are very dark. Once they reached about six months the dark noses began to turn a briskish colour and now they all have dark pink noses with darker creases and nostrils, light purple tongues and still pink gums. In the UK some pink is acceptable on creams mouths where it is considered a fault on darker chows. In the show ring you will not be penalised here for those lighter colours. In the US I believe they do penalise it in the show ring. 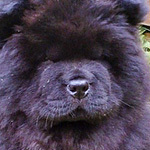 It doesn't mean your chow is not a chow because its mouth is not blue black but can cause problems if you want to show. (a) Dogs must never be sold on a “with or without papers” basis. As noted in Section III. (b) above, all dogs must be registered with CKC. (b) In accordance with The By-laws, the breeder is responsible for the submission of and payment for all registration applications. Such costs may be included in the price of the dog. Under no circumstances shall the buyer be asked to submit or pay for any applications to register or transfer the ownership of a dog. Apparently in the USA the rules are different an in fact the buyer registers their own dogs , there doesn't even seem to be any requirement for breeders to register their own dogs. Boy that's a shortcoming! Yes Merlin, it is different. For AKC pups, the breeder only registers the litter to certify that the lineage is purebred. The owner of the dog then registers a transfer of the pup and pays the fee. But even then, that is not a requirement. Litters do not need to be registered. Although it requires a bit more documentation, the owner can register a pup with a copy of the family tree. And, i could be mistaken on the count, but i believe it only requires 4 generations. I have a cream chow who is 6 years old. She's always had the black tongue and a pinkish nose. Lately we've noticed her tongue's color is changing to a lighter color. It was my curiosity about this phenomenon that brought me to this thread.